November 2, 2013 - On Friday at or about 9:20 AM passengers at Los Angeles International Airport (LAX) ran for cover after a gunman who has been identified as 23 year old Paul Anthony Ciancia of Los Angeles went off on a shooting spree killing a Transportation Security Administration (TSA) employee and injuring at least seven before airport security was able to subdue and take him into custody. Ciancia is believed to have acted alone and the circumstances of the shootings remain under investigation. The FBI reported the gunman had been ranting about a New World Order and was carrying a note that indicated he "wanted to kill TSA and pigs." 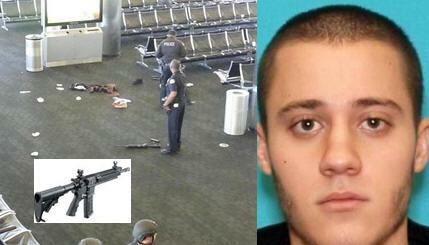 Ciancia, dressed in fatigues and carrying a carry-on bag opened fired with a AR-15 semi-automatic assault rifle in Terminal 3 killing TSA officer, 39 year old Gerardo Hernandez and wounded two other TSA officers. LAX Chief of Airport Police, Patrick Gannon, said Ciancia "pulled an assault rifle out of a bag and began to open fire in the terminal." Dr. David Plurad of the Harbor UCLA Medical Center reported Officer Hernandez had suffered severe gunshot wounds to his chest and abdomen. Officer Hernandez was reported to be behavioral detection officer trained to detect behaviors that were "not right, not normal." Ciancia was shot in the chest multiple times. It’s believed that he was taken to Ronald Reagan UCLA Medical Center were he remains in critical condition. It has been reported that Ciancia had over 100 rounds of ammunition in his possession. On Friday morning just before the shooting Ciancia’s father called New Jersey police to report his son had text a sibling stating he had planned to take his own life. On Friday afternoon the FAA reported "the situation at LAX is very fluid. There is currently a ground stop for flights that are scheduled to depart for LAX. This means those flights are temporarily being held at their departure airports. Arrivals and departures are still occurring, and some flights may be diverted. The FAA is closely monitoring the situation and making adjustments to arrival and departure flows as needed. Passengers should contact their airline to determine the status of their flight." By 7 PM the Los Angeles Police Department bomb squad conducted a sweep in both Terminal 2 and 3 and the FAA allowed departing flights to resume operations although Terminal 3 remaineds closed and is an active crime scene. On Saturday airport authorities reported over 1,550 scheduled flights and about 167,050 passengers nationwide were affected by the shootings.